I learned a lot from yoga instructor N and her companion Raja. 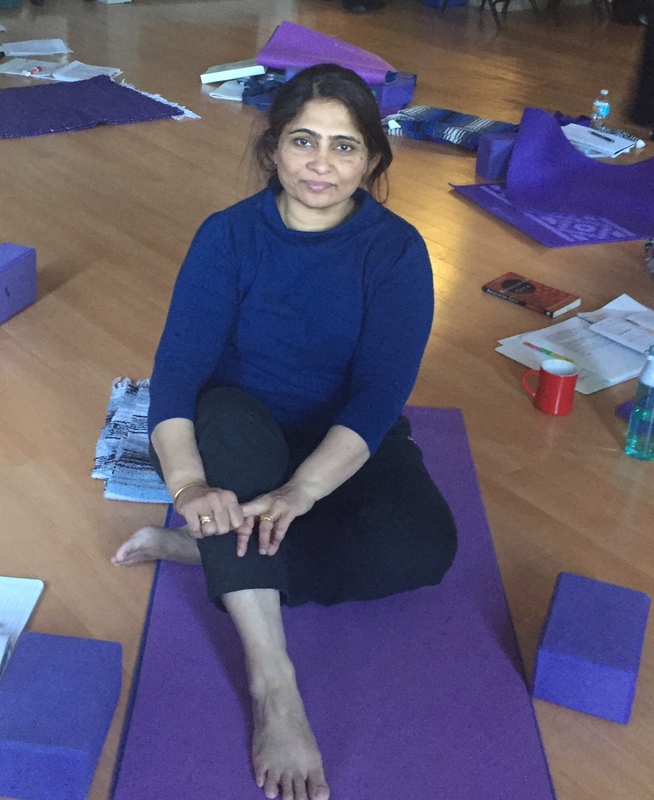 I introduced you to prana, the Sanskrit word for “life force” and demonstrated different breathing techniques – Dirgha and Nadi Shodhana – to move prana through the body. Over the past several months, I’ve learned additional ways to use breath to calm and focus the mind, build lung capacity, and activate energy in the body. From Ujjayi, great sound breath, to Kapalabhati, skull shining breath, Sama Vritti to Vishama Vritti, both with a counting rhythm (Sama is equal counts with inhale and exhale and Vishama has a longer exhale) – I’ve witnessed how marrying breath with movement can bring greater benefits to the body and mind. 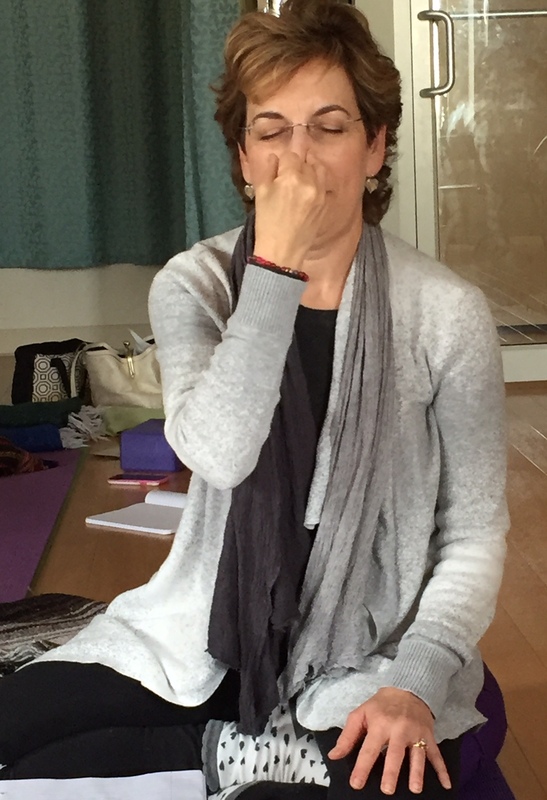 I practice meditation with Nadi Shodhana breathing, alternate nostril breath, to help lower my blood pressure and relax. My artistry of asanas has multiplied with a broad portfolio of poses to choose from as I enhance my own practice and craft sequences to teach others. There are joint-freeing series, reclining poses, seated poses, standing poses, backbends, forward bends, twists, and inversions. There are the three-dimensional aspects of poses, their Sanskrit names, and proper alignments. There are key benefits, precautions, and contraindications for poses, plus modifications and assists for those who may need help. 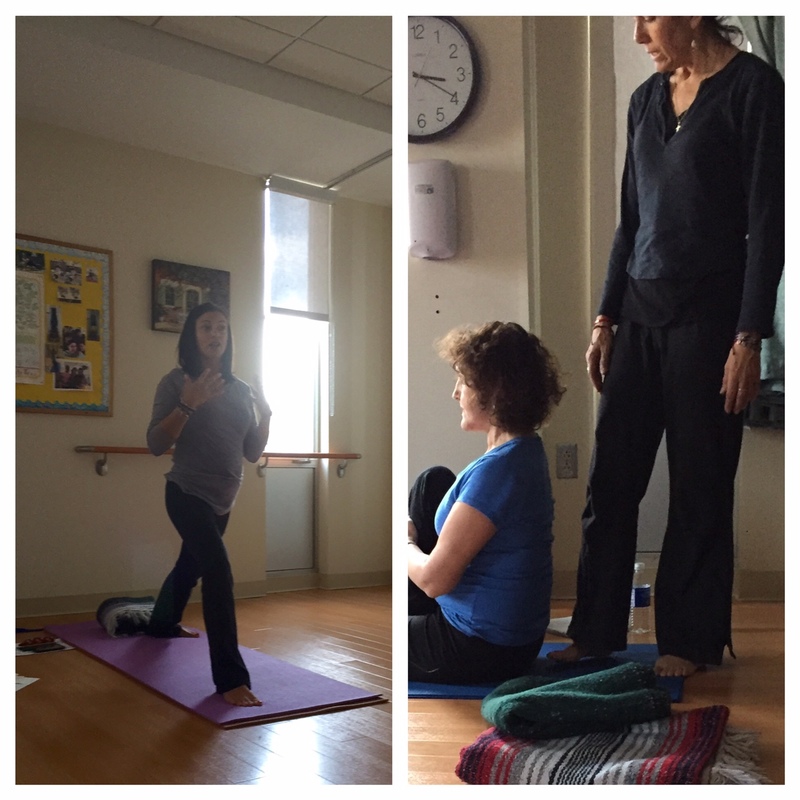 Our instructors L and M show us the correct alignment and assists for poses. We begin each sequence with centering. “Let your thoughts go. 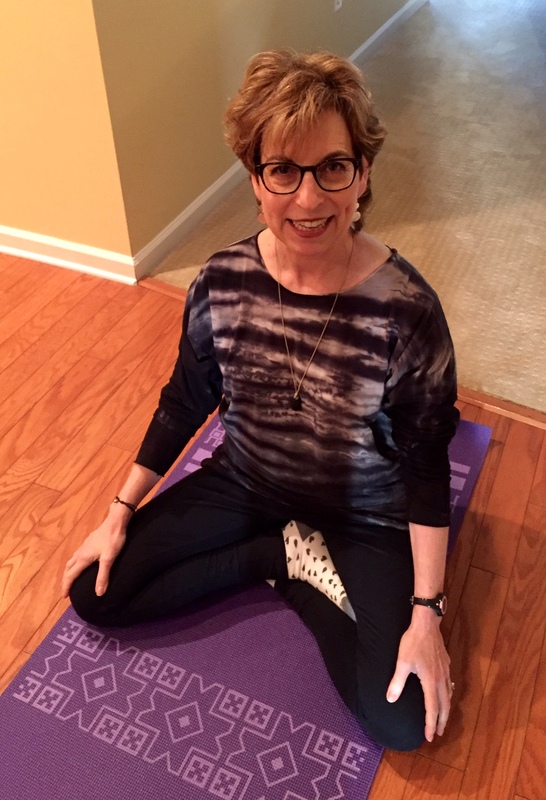 Bring your mind to the mat as well as your body,” said my instructor L. We end with savasana, known as corpse pose, the most important asana of them all. It’s when the body and the mind totally relax lying flat on the mat and the goodness of all the other poses melts into every cell. I use blocks, blankets, and straps as props when doing yoga poses. 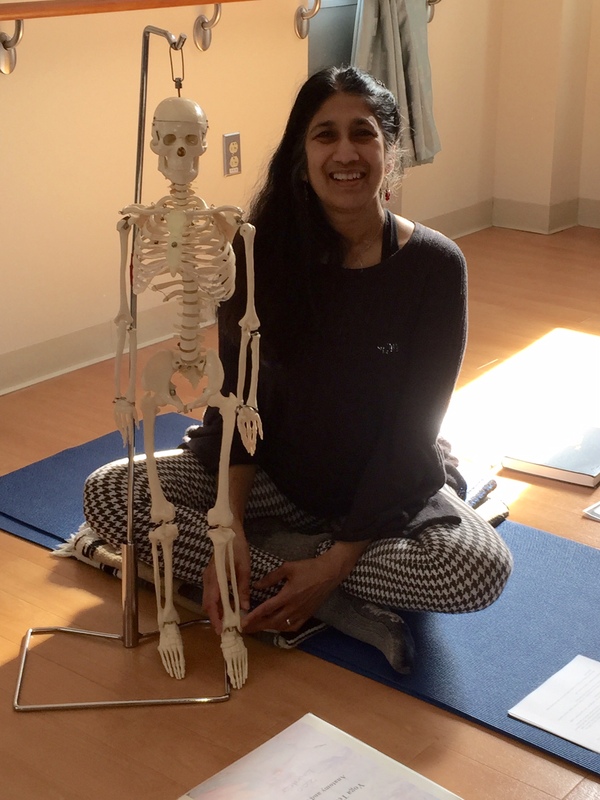 While I am not as flexible as some of my younger students, I use props, such as blocks to lift the floor, a strap to lengthen my arms, and a blanket under my seat to tilt my pelvis so I can sit up straight. I no longer take “no” for an answer when my friends say they cannot do yoga. Everyone can do yoga. But not everyone looks the same in every pose. Our instructor T demonstrates poses to student A during training. Morning meditations have become a daily ritual. Learning to be in stillness is part of my training and provides a sense of calm. I sit up tall on my cushion with my legs crossed and my eyes closed. Some days I use my mala beads and focus on a mantra (lately the mantra has been a healing one for all the dental surgery I’ve endured the past few weeks). Or I listen to Dr. Deepak Chopra meditations (which I highly recommend) or other meditation apps such as MeditateMe. Sometimes I do evening meditations to relax my monkey mind before sleep. 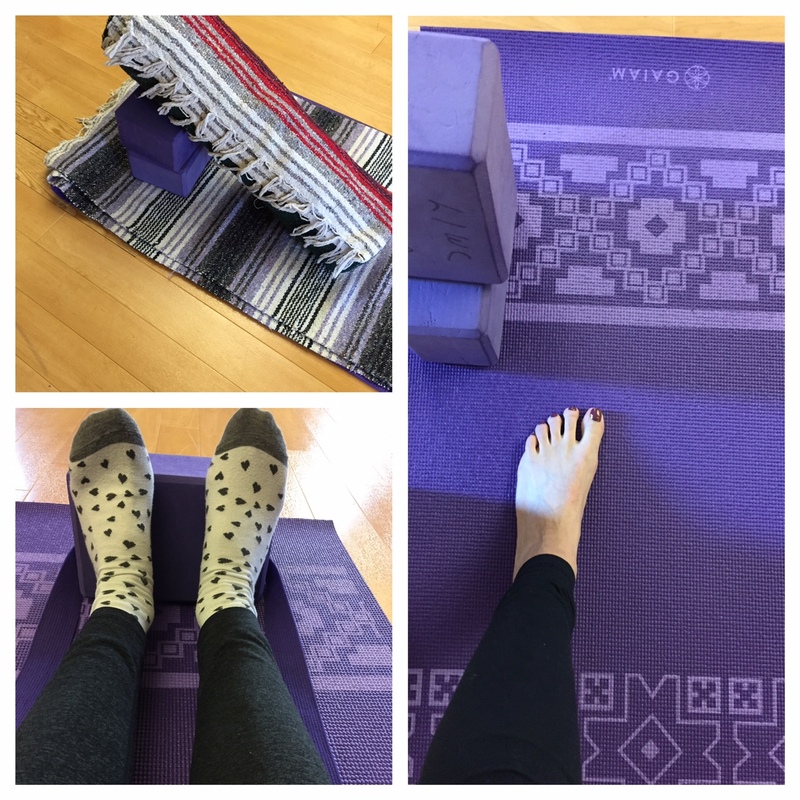 Taking yoga off the mat and becoming more introspective has been a spiritual part of my journey — from reading Stephen Mitchell’s translation of the Bhagavad Gita, a time-honored Sanskrit poem, to examining the Yoga Sutras, an ancient text written by the scholar and supposed physician Pantanjali in 200 B.C.E.. I’ve acquired a sense of deeper consciousness, both my own and the world around me. 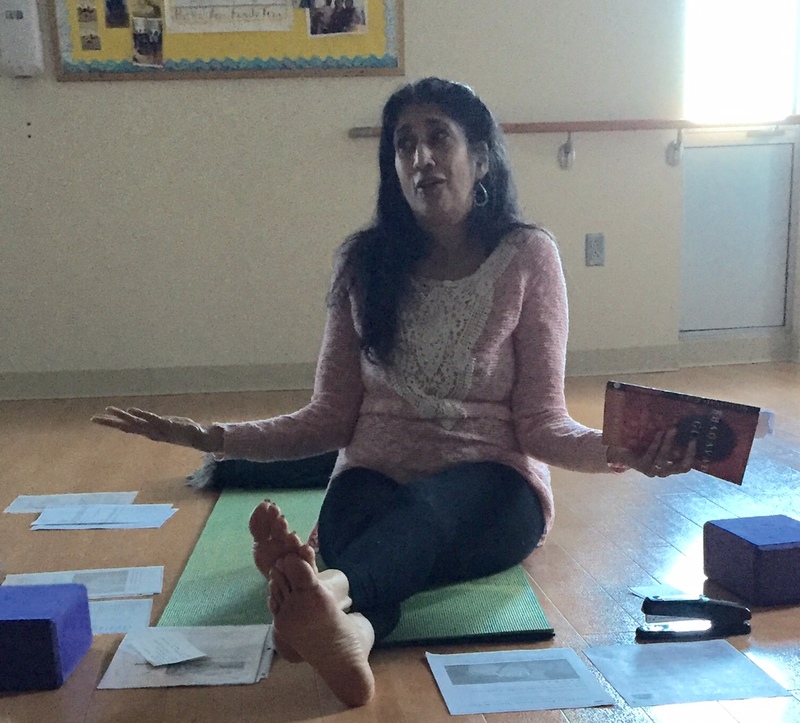 Our instructor N shares wisdom from the Gita, an ancient poem about the battlefields of our mind. “The Bhagavad Gita or ‘Song of the Blessed One’ is about two families fighting for kingship,” said my instructor N. “It’s a battle drawn out over many years. It is meant to symbolize the battles we have within ourselves.” The story is told in a dialogue between Arjuna, a son of one of the families who is facing a spiritual crisis, and Krishna, the god Vishnu. “The Gita teaches us that when there is violence, everyone hurts,” said my fellow student H, whose family is from India and is well-versed in the Gita. My fellow student H is very knowledgeable about the Gita. I also enjoyed reading Living Your Yoga by famed yogini Judith Lassiter. Judith draws from the wisdom of these two texts in simple terms, with techniques for “awakening awareness using yoga within yourself, widening the circle using yoga within relationships, and embracing all life with yoga and the world.” Chapters on Letting Go, Courage, Relaxation, Patience, Compassion, Fear, Success, Truth and Love – are some themes that especially resonated with me. With about six weeks to go until my YTT200 is complete, it feels like I have so much more to learn. I’m realizing that this transformation journey I’m on during my life after 50 will really never be over. Once touched by the awareness yoga brings, you start to crave it. And the more you work on it, the better you become at it. That’s why yoga and meditation are a practice. I have courage to stay open to whatever the future brings. “What are your plans for when you graduate?” is a popular question in recent dialogue with family and friends. “I’m not sure” is my usual answer. For now, I’m focused on my studies and preparing for my final exam and practice teach. It’s a reminder of two mantras I’ve chanted of late, “to have faith in myself” and ” to have the courage to act from my heart and the compassion to stay open” to whatever the future brings.